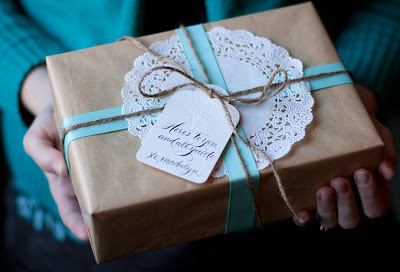 Yesterday I read a great post on The Thrifty Chicks blog about thrifting gifts to people this holiday season. The writer was so raw about her own challenges this Christmas as her family tries to get through economically difficult times, and I loved what she had to say about taking things she'd thrifted for herself and giving them as gifts to family and friends. "It disturbs me how so many Americans are in extreme economic hardship but the media doesn’t really reflect this. The holiday commercials still run on an irritating loop. For those of you hit by these hard economic times. Please fall out of the retail hypnosis of the season and give of yourself. Think about what others might enjoy that you have and let it go. Isn’t that what you’re supposed to do with love? No doubt, the market wants us to think giving used items is an insult and not considerate. A monetary transaction – one mostly on a credit card that is accruing debt – must transpire to legitimize a gift. Least, that’s what we’ve been led to believe." So, in an effort to support these ideas, I thought it would be great to pass along some tips for thrifting your Christmas gifts this year. Step 1: Break out that Christmas gift recipient list. Once you have all the names written down, go through each one and list any hobbies the person might have; any collections they've started; favorite colors; favorite authors, etc. Step 2: Research your area to find the thrift stores nearest you and map out a plan of attack. Some stores have websites, or listings on sites like Yelp, that tell you the store hours and when/if they're having any sales. If you can't find that information online, pick up the phone and ask someone who works there. Step 3: Grab your list and carve out an afternoon to find your gifts. Since the odds of you finding something for everyone in just one store are slim, it's best to plan on going to two or three. As you go through the aisles, place things in your basket that complement what you've written next to someone's name. You might not end up buying them, or you might end up with several small things for one person that you could fit nicely into a cute basket. Step 4: Once you've made it down each aisle, go back through everything to give it careful thought and a thorough inspection. You want to make sure what you're buying is something the person will really love and find useful, not something that "will do." You also want to make sure it's in excellent condition. Some things might need a little cleaning, or perhaps a minor repair, which is worth the time for the money you save. But anything that requires more work than you're capable of goes back on the shelves. Step 5: As you're shopping, also consider how you might be able to pair a thrifted item with a new one to create a nice little set. For instance, say you have someone in your family who loves to bake and you come across an amazing vintage cake stand. A great way to spice it up is to include one of your favorite baking books, or maybe a cake serving set. Get creative and think outside the box! Step 6: Keep an eye out for containers, baskets, fabric, ribbon, etc. that you could use for wrapping the gift. Step 7: The main thing is having the attitude that shopping in a thrift store is just like shopping in any other retail space, you just don't know ahead of time what the merchandise will be (which is just more exciting, isn't it?!). Step 8: Let me know if you take the p at thrifting route for any of your gifts this year! I'd love to hear how creative you got!